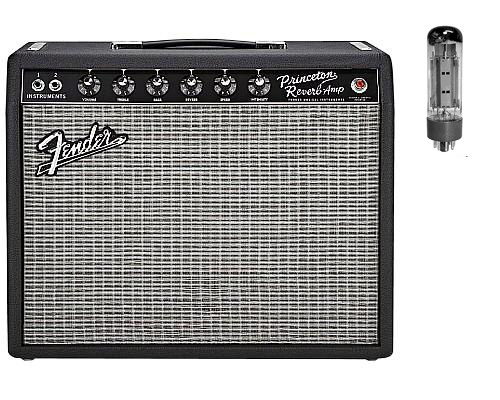 The Fender 65 Princeton Reverb is a historically significant ampÎthe originals fetch more than Euro 2,000 these daysÎand it´s as valid as ever in today´s musical world. The original was used on countless hits over the years, and the new ´65 Princeton® Reverb is easily versatile enough to go from your living room to the recording studio to small gigs. It´s got the vintage vibe that Fender die-hards know and love, but the ´65 Princeton® Reverb isn´t only for the old-school guys who played ´em 30 or 40 years agoÎit´s for anybody who craves top-notch tube tone, naturally dynamic clean and overdriven tones, and unmistakable long-spring Fender Reverb and tube Vibrato.